Erected in 1699, this iconic statue of King Bhupatindra Malla is located at the Vatsala Durga Temple and the only remaining royal pillar in the Katmandu Valley. Travelers can see the former ruler’s hands folded into prayer atop this important city symbol. Detail-oriented visitors may even notice the small bird perched atop the serpent’s head, which is said to support the entire capital. 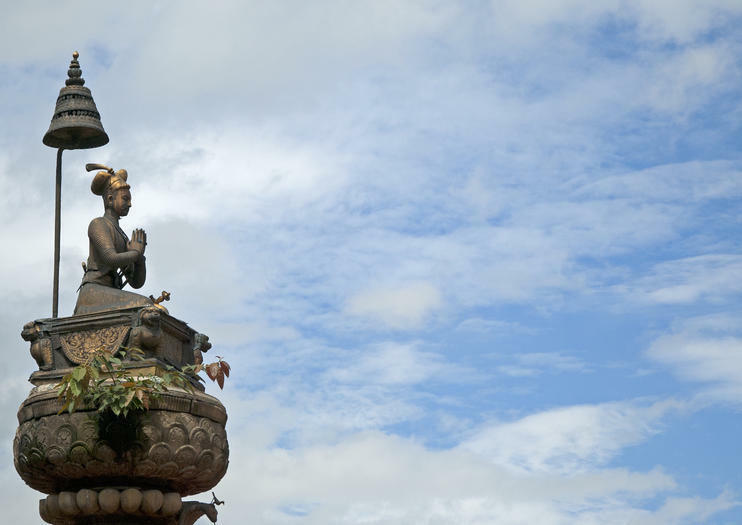 Though tucked among some of the area’s most incredible examples of architecture, history and art, the statue of Bhupatindra Malla is not to be missed. The statue is located in Bhaktapur Dubar Square near the 55 Window Palace, in front of the Vatsala Temple and the Golden Gate.